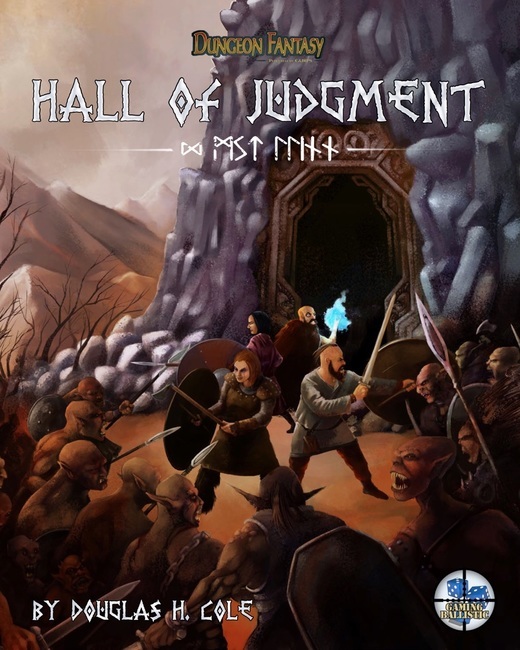 In a meta-GURPS way, this is kind of a special, potentially paradigm changing book; it might be the first major third party GURPS (technically, Dungeon Fantasy RPG) supplements completely endorsed by Steve Jackson Games. Its potential success or lack thereof could have an impact on future third-party supplements, so in that particular vein, it's a pretty exciting book. I backed the kickstarter at some level, forget which, but the one that gets the hard copy and the digital copies; I'm informed that my hard copy is in the mail, so this review is mostly based on the contents of the digital media. I doubt the physical media will have a world changing effect on my opinion, but if it does, I certainly will revise this review. With that segue complete, I'd like to say now that despite the book not looking like something I wanted, I bought the book, and I was not surprised; it was very much what I expected anyway: a pretty down-to-earth dungeon delve with some Norsey trappings. I knew I am not particularly fond of most of those things and I still bought it hoping that maybe it would defy my expectations; it didn't. It was exactly what was advertised. So if you read the blurb on warehouse 23 and you like what you read, you might like this; if you read the blurb and you don't like what you are seeing, there is a good chance you won't like it. In any case, let's take a closer, more detailed look; let's see what I liked and didn't like, and paint a clearer picture of my conclusion. 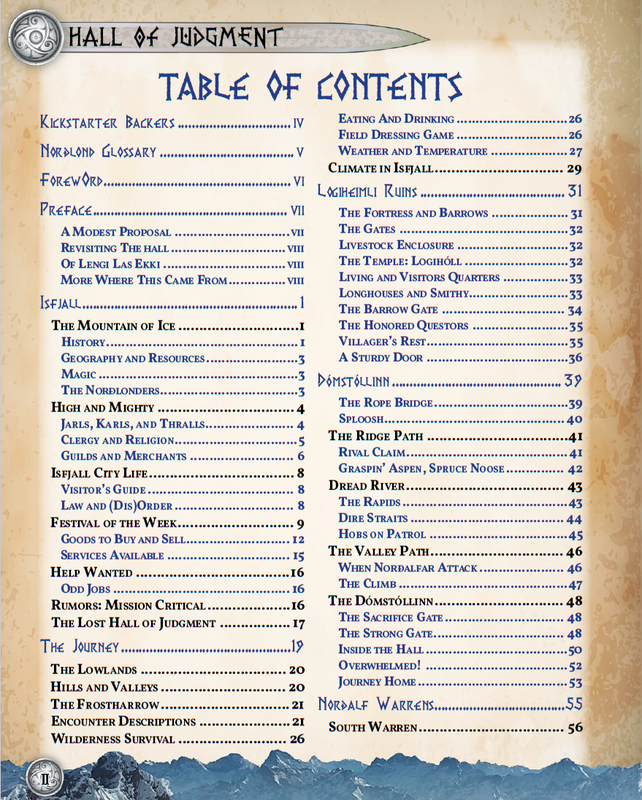 The PDF is a 132 page document which includes all the front and back matter: Two pages of cover, two intentionally blank pages, title page, two pages of contents, a Kickstarter acknowledgement page, glossary page, one page foreword by Sean Punch, GURPS Line Editor, a two page preface, and a one page index. This leaves us with 119 page of book. Organizationally, the book makes sense mostly. As you can see from the screenshots of the table of contents, those entries are hyperlinked, and various places throughout the book are also hyperlinked for browsing convenience. Including the index and some cross references. Sometimes the contrasting and anti-aliasing of background textures and font colors is just a little difficult to read, this is compounded in some places with very small fonts, but I'm told this looks much better in print. I guess I'll find out for myself soon. Illustrations are all over the place with some very good ones here and there, a lot of passable ones, and some that aren't great. The clashing of style isn't usually a distraction unless you are flipping through the book quickly like I do after reading a book a while ago and trying to remember everything for a review you are writing. One example I would like to bring attention to though are the maps. Some of the high level hand drawn "macro" scale maps are a pleasure to look at. On the other hand, some of the battlemaps look like cookie cutter CGI; they do the job they need to do, but I think they are almost the bare minimum of what is needed for the sake of functionality. 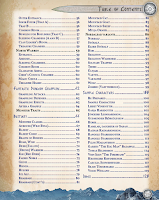 The first chapter, 18 pages, describes the starting town of the adventure. The next chapter, 12 pages, has some wilderness survival mechanics. The next three chapters, 31 pages, describe the three main "dungeons" of this adventure. After that is an abbreviated 4 page chapter describing the "Fantastic Dungeon Grappling" system, a derivation of Technical Grappling for GURPS, reorganized and streamlined to fit the genre better. 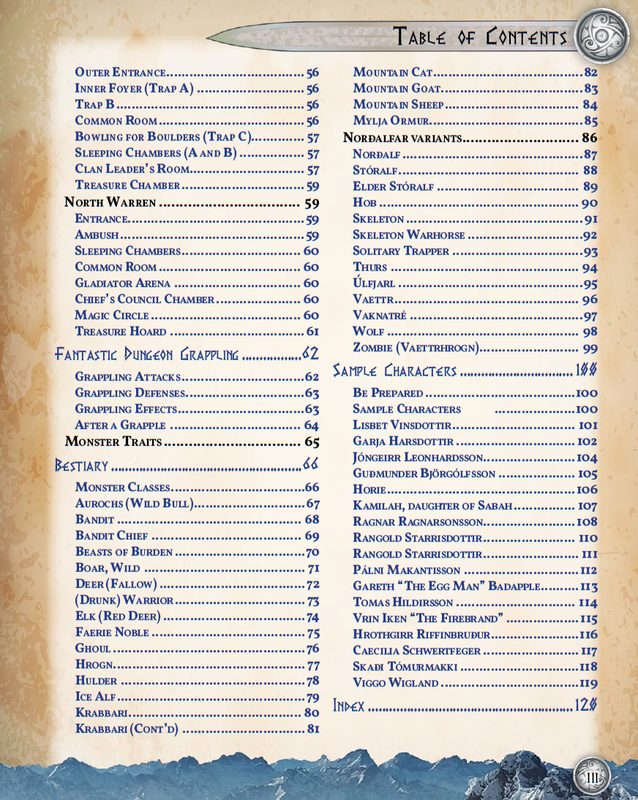 Next is a 34 page bestiary, and the last chapter is a 20 page list of sample characters. Eight of the 16 characters are submitted by kickstarter backers. One last note on style. A lot of the book is consistent and well written, but there are a few groan inducing pop-culture bits or nods to memes here and there that didn't sit well with me. But those aside, I didn't have much problem reading the book. The dry stuff out of the way, let's start dissecting the rest of the book. This chapter discusses the hub town of the adventures described in this book; a Norsey mountain village with Viking-ish NPCs and sensitivities. 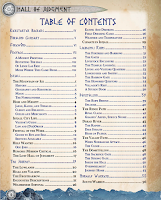 As mentioned earlier, this is a very long 19 page chapter with a lot of detail; local customs, religion, businesses, things to do for the party. The detail is good especially when it comes to the interesting bits on shopping, but I feel like it somewhat lacks in terms of interesting NPCs. A scant few names are dropped, but very little description is given for the names we get. I guess populating the town is a DIY. Part of this chapter describes important outdoor encounters, and part includes some unique mechanics. I'm going to set aside the adventure content until I speak to them in the next little section, and focus mostly on the mechanics. The chapter includes 4 pages of rules for outdoor survival, mostly along the lines of how to turn animals into food, how to find water, and what extreme temperatures can do to one's health. Hiking times seem like a simplified derivation from Dungeon Fantasy 16, and one could probably reasonably sub that book in for more detail in those respects if they like. Altogether, these rules seem like things we've seen before with nothing especially groundbreaking, but it is simpler and in one place. These chapters describe the adventure parts of the adventure, and I don't like getting to the nitty gritty on this during reviews for fear of spoilers. 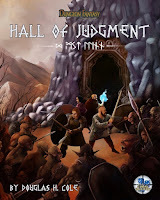 In the abstract, the adventure is well written and gives a decent amount of freedom in how it is approached, but seems to, by default, make some demands of party composition (namely, the big quest, as written, might be next to impossible to brute force if the party is without some types of magic; and interestingly, a lot of games I have run, players shy away from the casters.) A lot of the encounters are pretty mundane or undead, and I don't find those things exciting, so it was a bit humdrum to me, but it does help accentuate some of the interesting strengths of "Dungeon Grappling" while hiding some of the more complicated/troubling bits that might occur with a more "interesting" bestiary. Combat maps, functionally speaking (I've already critiqued them aesthetically) are more on the "featureless rectangle" part of the combat map spectrum, without a lot of interesting obstacles or traps. I say mostly, but three of the seven maps have at least a modest array of distracting and complicating terrain to mix things up. This 4 page chapter is a miniature Technical Grappling for DFRPG. The chapter is overall mostly easier to read than the original book, and next to nothing important is missing. Altogether, very well written and organized. The bestiary adds 35 "monsters" for players to fight, but a lot of them are naturally occurring wild (and domesticated) animals or humanoids, which I find kinda boring, but that's the kind of setting this is. To be exact, 29 of them fit into this category, leaving 6 monsters that feel fresh and exotic. Ah well, for some, that's absolutely fine. Gotta be honest, I just scanned this chapter because pre-made characters aren't really exciting to me. The first page has some really good advice on party composition though, in general, and definitely specifically for the adventures in this book. I also really like the Designer's Notes attached to each character that give some tips that are pretty good to consider for beginner players who might make their own characters. Notable is the inclusion of the Eldhuð racial template, something like a diet Infernal; only 20 points, not nearly as powerful, but maybe even slightly less interesting than the already dull infernals, with less outstanding boons and flaws. That said, if a GM is limiting races to only this and those that appear in Dungeon Fantasy - Adventurers tome, it's still probably (disappointingly) one of the more interesting ones. It is apparent when reading my review that this book isn't up my alley. I think if we set aside that it clashes with several of the things I look for in interesting fantasy settings and game scenarios, it is mostly well put together, but a few standout grievances I can't completely discount as "it isn't my thing" like the sudden transitions from good writing to "hey, you kids like the memes, right?" or the uninspiring battle maps. As for value, the pdf is only $12.50 on Warehouse 23, and I think what you get for that is fair. Finally, in the grand scheme of things, I hope this partnership bears some fruit, and that if it does, perhaps more books tailored to my expectations and wants might come out of it.